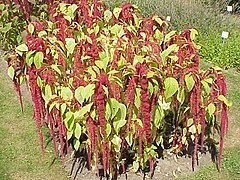 Amaranthus (a Graecis ἀμάραντος 'semper recens' + ἄνθος 'flos') est cosmopolitum genus plantarum annuarum et perennium breviter viventium. Nonnullae species pro holeribus, pseudocerealibus, et plantis ornamentalibus coluntur. Plurimae species sunt aestivae plantae inutiles annuae. Cymae sicut amenta floribus crebro conferta aestate vel autumno maturant. Circa sexaginta species accipiuntur, inflorescentiis et foliis a purpureo et rubro ad viridem et aureum variantibus. Speciebus sunt multae proprietates et usus etiam in Celosia, genere arte conecto. Amaranthe, grex metallicus Suecicus, ex hac planta appellatur. Formae calvariarum amarantho et melle pro die mortuorum in Mexico factae. Traditionalia bellaria Mexicana amarantho facta. ↑ Latissime Anglice pigweed appellatae (Bensch et al. 2003). ↑ "Search results — The Plant List". 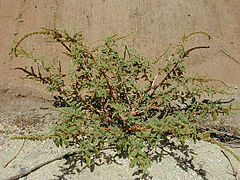 theplantlist.org . ↑ Synonymum Amaranthus viridis (TPL). Bensch, et al. 2003. 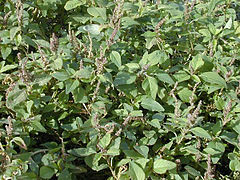 Interference of redroot pigweed (Amaranthus retroflexus), Palmer amaranth (A. palmeri), and common waterhemp (A. rudis) in soybean. Weed Science 51:37-43. Howard, Brian Clark. 2013. 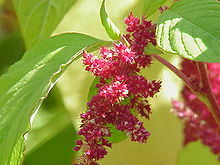 "Amaranth: Another Ancient Wonder Food, But Who Will Eat It?". National Geographic Online, 12 Augusti. Kindersley, Dorling. 2008. RHS A-Z encyclopedia of garden plants. Britanniarum Regnum. ISBN 1-4053-3296-4. Lenz. 1859. Botanik der alt. Greich. und Rom. Murr, J. 1890. Die Pflanzenwelt in der griech. Mythol. Fanton, M. et J. Fanton. 1993. 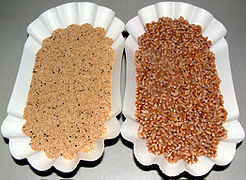 Amaranth: The Seed Savers' Handbook. Vicimedia Communia plura habent quae ad Amaranthum spectant. Grain amaranth, Crops For A Future. Novissima mutatio die 21 Martii 2017 hora 20:10 facta.